Warminster, PA – CRC Industries, Inc. announced it will launch its CRC GDI IVD® Intake Valve & Turbo Cleaner at the upcoming 2016 AAPEX and SEMA trade shows during Automotive Aftermarket Industry Week in Las Vegas, NV. The launch follows extremely successful test results on turbocharged engines. Originally introduced as CRC GDI IVD® Intake Valve Cleaner, “Turbo” was added to the name after testing confirmed its impressive turbocharger cleaning abilities. The product was designed to dissolve damaging carbon deposits from intake valves of all gasoline-powered vehicles, particularly gasoline direct injection (GDI) engines where carbon buildup on intake valves is a significant issue. “Excess carbon deposits on intake valves causes power loss, poor fuel economy and a host of other performance problems in GDI vehicles,” said Julie Williams, product manager, CRC Automotive Division. “CRC GDI IVD® Intake Valve & Turbo Cleaner is proven to remove up to 46 percent of these power-robbing deposits after the first hour of use. “Our testing has also proven the product is equally effective for vehicles equipped with turbocharged engines,” she said. According to Williams, this is the perfect time for CRC to expand its target market to include turbocharged vehicles. Most GDI engines are equipped with turbos to get more power from a smaller engine. Targeting vehicles with turbocharged engines allows the company to reach more users today while the number of vehicles with GDI engines continues to grow. Recent research shows that in a little more than three years 71 percent of new car production in North America will feature GDI engines. “CRC makes the only product in the market with proven results like these,” Williams said. CRC Industries, Inc. is a global leader in the production of specialty chemicals for maintenance, repair and operational professionals and do-it-yourselfers serving the automotive, industrial, electrical, marine, heavy truck, hardware and aviation markets. The company was founded in Pennsylvania in 1958 as Corrosion Reaction Consultants with a single product. Today CRC products are sold around the world, and CRC operates 26 facilities producing more than 80 million cans of aerosol products each year. 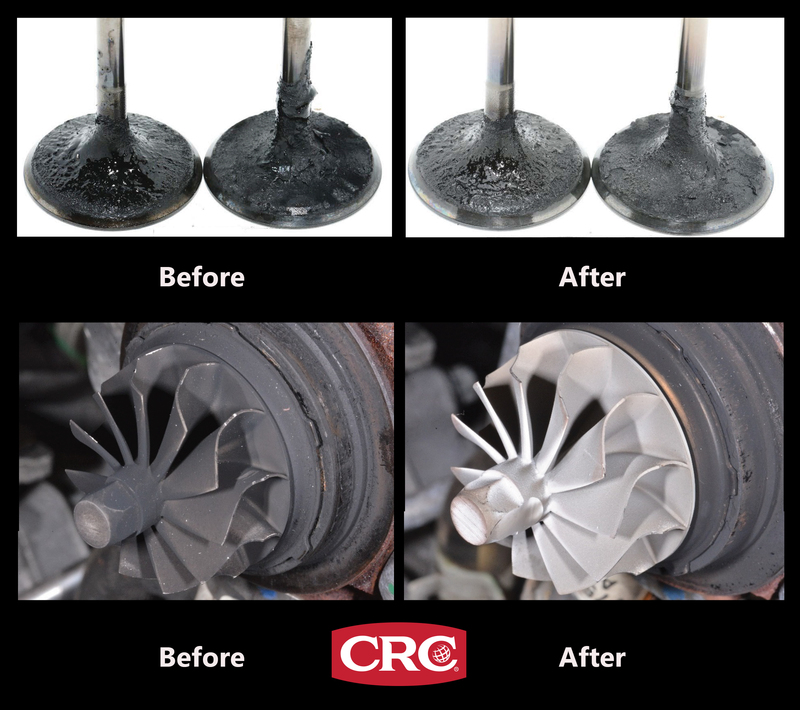 Intake Valves and Turbo Impeller Before and After Cleaning with CRC® GDI IVD® Intake Valve & Turbo Cleaner.